The international jury for the 26thPiranesi awards met on 21 November 2014 in Exhibition place Monfort. The jury was led by Anže Koren, Katarina Čakš, Majda Božeglav-Japelj in Tatjana Sirk. The sculpture for the Piranesi Award is work of the internationally recognized Slovene sculptor Boštjan Drinovec. Project is masterfully integrated into the landscape in a responsible and modest way. The jury commended the elegance of the site strategy in composing the buildings into the site which is reinforced by the materiality of the building. Roof of the main building is both vernacular but also modern and playful solution. 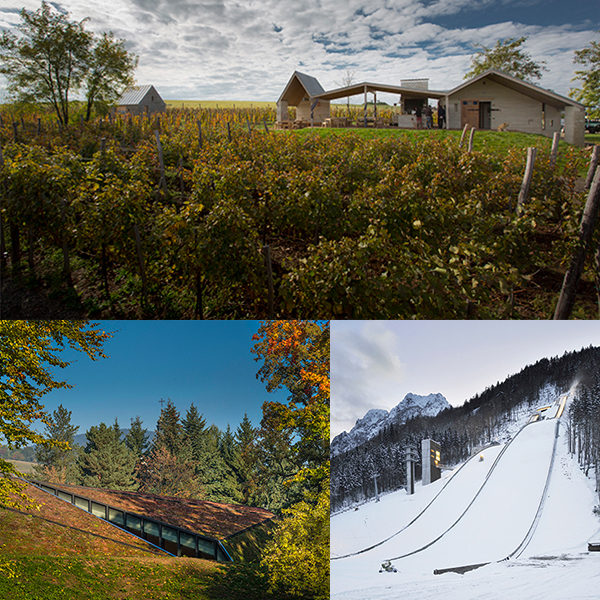 In a decade defined by iconic ski jumps, this project is recognized for taking a radically different approach producing a harmonious integration into the landscape. The project succeeds in emphasizing the ski slope in the composition and the auxiliary buildings are complimentary and quietly observe from the sideline. The jury appreciated the sculptural integration of the building into the landscape, the dual function of the garage, and detailing of the project. Interesting sculptural form of the ceiling reflects the submerged cave-like condition of the building yet creates intriguing interior spaces. The jury greatly appreciated the construction of the program and its sculptural architecture is beautifully articulated. The project is an interesting and intelligent proposal for everyday problems within an everyday surrounding.